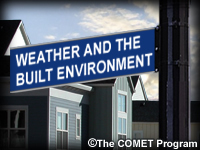 This short course provides broadcast meteorologists, educators, and the public with an overview of the evolution of our modern urban environment with a focus on impacts on the urban watershed, air quality, and climate. This course complements the course Watersheds: Connecting Weather to the Environment and both are part of the Earth Gauge™ environmental curriculum for weathercasters and educators. This curriculum is being developed by the National Environmental Education Foundation (NEEF). [See http://www.earthgauge.net/wp/] Unit 1, Where We Live, takes a look at past and current U.S. growth patterns and the way our urban areas have evolved from compact population centers to automobile-dependent sprawl. Unit 2, Impacts on the Watershed, explores how the built environment affects the water that moves through an urban watershed. Unit 3, Impacts on the Atmosphere, highlights the way our urban landscape and industrial activities impact the air we breathe and the local climate. Each unit includes information on ways to reduce our impact on our water and air with ideas ranging from simple changes in our commuting and housekeeping habits to changes in how we build houses and roads. A must and worth to be shared lesson to my colleagues. I liked this one. Not too long and the quiz was relative to the material. 1. Course is 11 years old. Things have changed, and the course should be updated.2. Course title isn't really appropriate for the course. The course is more about the environmental impacts (air, water, soil, aquifer.....) due to industrialization and modernization of our society.3. Presentation is more than a bit one sided when discussing, for example, coal power. I'm more of a nuclear power supporter, but many strides have been made with providing cleaner and more efficient power from coal. In one place in the presentation, the course mentions that impacts are important, but also are the actions to correct impact. Adding a module on what's been accomplished will provide a more objective presentation, and could have a motivational effect on people by letting them realize that "we've come this far" so, "let's continue". 4. The USA has done A LOT to lessen our impact to the environment. Many other countries need to engage; China and India come to mind. I understand 30% of the pollution in so. California comes from China. :(5. The course presents a lot of good info. So although it is a bit biased, and sorely needs updating, I can't say I wouldn't recommend it at all. I might recommend it to someone with no background in NEPA or environmental impacts, or someone who is oblivious to the environmental impacts of our society. I probably would give the course 2.5 stars if I could. I found this to be a useful education. My previous work experience exposed me to much of the water related information. The module that included the air and climate components helped round out environmental knowledge for me. Quiz did not seem to reflect items covered in the lesson. The answer choices did not match the study material.